If we’re going to talk about dynasties, let’s admit that there are dynasties and then there are DYNASTIES. 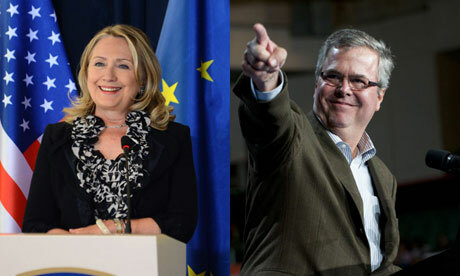 Jeb Bush and Hillary Clinton are only being as coy as they can get away with when it comes to whether they will or won’t announce any time soon their candidacies to run for president in 2016. Many commentators have been sounding the political “dynasty” alert since Hillary stepped down as Secretary of State and now they’re doubling down on that meme as Jeb has announced his “active” exploration of a White House run. If we’re going to talk about dynasties, let’s admit that there are dynasties and then there are DYNASTIES. Political journalist Jill Lawrence is concerned that “[a] second President Clinton or a third President Bush would send the depressing message that Barack Obama’s classic American Dream ascent was a fluke.” But she’s forgetting that Bill Clinton was, in his own way, a transformative candidate in a way no Bush could ever be — he was not from wealth or from a family of any political status whatsoever, and made his way in the world on his smarts. The same can be said of Hillary — she was a working middle-class Goldwater girl who transformed in college in the 1960s, but there was no political family history or momentum to push her forward. Yes, the Clintons are their own powerhouse political family today, but their legacy, such as it is, doesn’t shout “dynasty” on the same level as the Bushes. George H.W. Bush’s father, Prescott Bush, was about as connected as you could be in his era. He was a Wall Street banker turned U.S. Senator. While his parents were middle-class, Prescott Bush attended Yale University, as his grandfather and uncle had, as did his son “H.W.”, as did his grandson “W,” complete with Skull and Bones memberships. After “H.W.” graduated from Yale, he became a millionaire in the Texas oil industry before running the CIA, being the U.S. Ambassador to the United Nations, heading up the Republican National Committee and being named U.S. Ambassador to China. Not to mention being Ronald Reagan’s V.P. So it wasn’t exactly difficult for George W. Bush or Jeb Bush to find the political connections and donors for their own political ambitions. They already had the pipeline in place; the Clintons, whatever you think of them, built what they have on their own without previous political connections or family money. So if we’re talking dynasties, let’s agree that there are big differences between the Bushes and the Clintons — the Clintons could be called a first generation bootstrap dynasty compared the the Bush’s multi-generational money and power dynasty. Even with the relatively close personal ties the Bush and Clinton families have today, let’s keep the dynasty issue in perspective — and really examine which candidate has the silver spoon and which one would be the next example of an American dream ascent. Joanne Bamberger is an independent journalist, journalism entrepreneur and founder of The Broad Side. She is also the author/editor of the forthcoming anthology Love Her, Love Her Not: The Hillary Paradox (an Amazon #1 Hot New Release). You can find Joanne on Twitter at @jlcbamberger. Also, follow The Broad Side on Twitter at @The_Broad_Side and on Facebook! Agreed. The right question to ask is about their values and politics, not about their families.